Treatment for IBS (Irritable Bowel Syndrome) usually focuses on changes in diet and lifestyle, avoiding foods that trigger symptoms, and managing stress. Individuals with IBS need to feel actively involved in their treatment; taking control and feeling empowered are really vital as IBS can seem like such an unpredictable condition. Some foods and situations will nearly always cause symptoms while others don’t, and it can be incredibly frustrating trying to pin down what you can and can’t eat without suffering an attack. Eliminate, reduce or avoid aggravating foods: With IBS there really is growing evidence that what goes into the mouth produces a reaction in the body, and that food is a really important factor.Some foods will nearly always cause symptoms while others don’t, and it can be incredibly frustrating trying to pin down what you can and can’t eat without suffering an attack. There sometimes seems to be no logic to it; far away from feeling empowered and in control. Dietary changes can be helpful for IBS patients, but no one speciﬁc diet is recommended because no two cases are alike. For more information about where to start with changing your diet please read on. Many people ﬁnd that exercise helps to relieve IBS symptoms. Aim to do a minimum of 30 minutes of exercise a day, at least ﬁve times a week. The exercise should be strenuous enough to increase your heart and breathing rates. Walking briskly, walking up a hill, cycling or swimming can all be helpful. Exercise is also good for reducing stress. Treatments for IBS are wide and varied and you may ﬁnd help from medicines that your GP prescribes, or that you can obtain from your pharmacy. Overall though, self-management is the key and apart from help with optimising any medication, often it is left to the individual to ﬁnd out what works best for them. A low FODMAP diet could help you reduce IBS symptoms. Some people ﬁnd that taking probiotics regularly can help to relieve the symptoms of IBS. Probiotics are dietary supplements that product manufacturers claim can help improve digestive health. They contain “friendly bacteria” such as Lactobacillus and Bifobacteria, that supposedly outgrow your “bad bacteria”, helping to keep your gut and digestive system healthy. 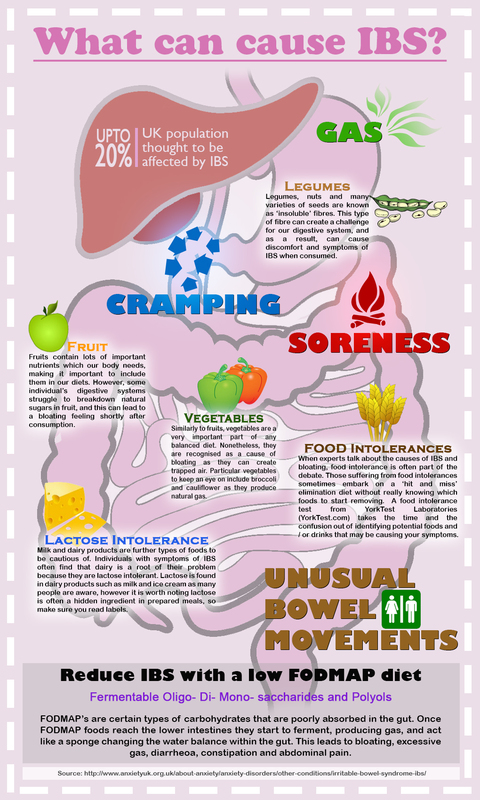 Probiotics can help to calm and regulate your bowels, but vary in their effectiveness. If after a month’s trial, one brand is not helpful, try another. Prebiotics can also be useful; these tend to be complex sugars that encourage the growth of your own natural probiotic bacteria. If you decide to try pre- or pro- biotics, make sure that you follow the manufacturer’s instructions and dose recommendations. • Think food and mood! • Try and take time out for YOU.